INTRODUCTION: Voluntary attention is shown to be involved with slower and more deliberative processing, as opposed to the quick reaction of involuntary attention. Voluntary attention involves the frontal brain regions dealing with both emotional/evaluative and planning/working memory processing; these are some of the areas most closely correlated to conscious experience. They are thought to influence the frontal eye field (FEF) and other parts of the fronto-parietal network that controls attention. Mechanisms of attention are seen as crucial for the brain to select behaviour-relevant information from the environment, with only some incoming signals beinge selected for enhanced processing. Top-down influences are argued to be the drivers in giving preference to inputs that are more likely to be relevant to goal-directed behaviour. Attention is seen as based on top-down signals feeding back through the cortex, with fronto-parietal areas modulating activity in both the thalamus and the sensory cortex. Perceptual processing is demonstrated to be more facilitated at attended locations than at unattended locations; inputs from unattended locations tend to be repressed. Moreover, neural activity is increased just by directing attention to a location, even in the absence of incoming stimuli. Spatial attention allows organisms to concentrate information processing on a limited spatial region. Top-down control is related to working memory, and to fronto-parietal areas tuning sensory neurons to attend to a particular location. With top-down or voluntary attention, working memory and related brain areas control the responsiveness of sensory neurons to particular stimuli and inhibit neurons that might attend to other stimuli. With exogenous or involuntary attention, the trigger for attention comes from outside the brain, for instance loud bangs or flashes. One distinction between involuntary and voluntary attention is that involuntary attention takes only about 50 ms after the initial input of a stimulus to register data, while voluntary attention takes 300 ms or longer. However, involuntary attention last for only a few hundred milliseconds, after which, either voluntary attention is attracted to the stimulus, or there is an involuntary inhibition of attention to the intruding stimulus. By contrast, voluntary attention can be focused for long periods. In general, voluntary attention and top-down expectations have more influence on the later stages of processing, and the length of time for which attention is held may be important in determining subsequent action and behaviour. Internal neural signals are seen to modulate the perceptions that result from sensory inputs. The research of the last 20 years demonstrates a clear divide between sensory input, and the internally driven modulation of sensory processing. Top-down signals from the prefrontal cortex bias the sensory system towards stimuli that are relevant for behaviour. The dorsal fronto-parietal attention network (DAN) is involved in the selection of task-relevant stimuli. Regions in the DAN respond to behaviourally relevant stimuli, in preference to equally strong signals that are not behaviourally relevant. In the forebrain, the frontal eye field (FEF) and the parietal both encode the relative importance of stimuli. However studies suggest that the frontal eye field is still downstream of the actual direction of attention coming from the dorsolateral prefrontal which controls the working memory. The forebrain system relates to slower more deliberative activity involving the working memory, while midbrain areas deal with responses to sudden threats. 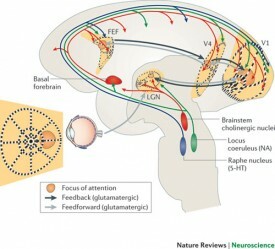 The direction of attention is seen as being coded by the activity of particular neurons, notably in the FEF. The FEF is thought to have connections to both the ventral and the dorsal stream, and attention is directed to where targets are likely to appear. Enhanced neural activity can be observed prior to the arrival of attended objects in the locations at which they are expected. Both visual and movement responsive neurons in the FEF were found to attend the location of spatial attention, and this neural activity is predictive of what the subject will detect. A third type of neuron in the FEF is capable of remaining highly active, even after the stimuli that originally gave rise to the activity has disappeared. The frontal eye field (FEF) receives converging inputs from many cortical areas, and may use visual representations in working memory to select targets for spatial attention. The operation of the frontal eye field (FEF), as distinct from other brain regions, is suggested to be independent of current sensory inputs, thus functioning in a purely top-down fashion, and having a unique role in the voluntary control of attention. Working memory is viewed as holding representations while a visual search is underway. Top-down influences direct visual attention, while shared neural mechanisms decide the items that are held in short-term memory, and these in their turn act as drivers of behaviour. Cognitive functions are seen as depending on information being retained in the brain, after the original signal input is no longer present. Visual short-term memory allows retained visual information to guide behaviour. The process of retaining a visual memory is suggested to involve a subset of the neurons that encode the original signal. The mechanism of attention that influences the original perception is also suggested to direct the visual short-term memory. Existing biases also help to determine which items survive longest in short-term memory. There is evidence of capacity limitations in the short-term memory. Thus change-detection for colour or shape declines when there are more than four items in the visual memory. This forces access to working memory to be selective and driven by existing biases. Preparatory attention involves top-down signals from the frontal and parietal areas, so that areas of the primary and secondary visual cortex can become activated even where no relevant signal subsequently appears. Biases also help to determine which items survive longest in short-term memory. The stability of frontal brain processing such as the short-term memory is seen to require protection from the sensory bombardment from the lower sensory cortex. The dorsal fronto-parietal network influences attention sensory neurons, but it is not seen as the real origin of voluntary biases, which are suggested to come ultimately from the brain’s reward systems. A distinction is made here between internally driven voluntary attention on the one hand, and on the other, involuntary attention given to unanticipated inputs from the environment. Attention and emotion are argued to be parallel processes interacting at many stages in the brain. Limbic regions act so as to bias sensory processing, and several emotional-attentional hubs are identified in the frontal areas of the brain. Emotional and motivational aspects are considered to drive attentional control, sensory representation and goal-directed behaviour. The emotional areas are seen to interact with the executive/planning/working memory areas. Attention and emotion are argued to be intertwined. Processes in the amygdala and other limbic areas are viewed as interacting with attentional controls in the fronto-parietal area and the ventral visual stream. Thus emotional arousal is viewed as altering the focus of attention. 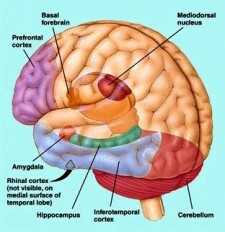 The amygdala is the most connected area of the forebrain and interfaces with the anterior cingulate, the insula and the orbitofrontal. These limbic regions interact with the dorsolateral fronto-parietal network to bias sensory processing and eventually behaviour. The emotional areas also have feedback influences on sensory processing, such as the ventral visual stream where the representation of emotionally significant events can be enhanced. More sustained attention can be supported by the emotional content of images.